Bitcoin’s value has grown significantly this year making people’s digital asset holdings worth quite a bit these days. Alongside this, bitcoin mining fees have swelled almost in unison with the price rise and some people have been paying an average of $3-4 per transaction. The rising fees continue to cause concern for bitcoin proponents and businesses using the digital currency for daily operations. The price of bitcoin had jumped to a record high the other day surpassing US$2900 per BTC across global exchanges, and is hovering at $2800 at press time. As the price has climbed over the past couple of months the number of transactions taking place on the network has also increased as the mempool has filled to over 200,000 unconfirmed transactions at times. For some perspective just a few months ago during the weekends, the mempool used to drop to 5,000 to 12,000 unconfirmed transactions. The current congestion has led to significantly sized fees across the network so people can get their transactions settled quicker. Bitcoin fees have grown significantly over the past year. Now bitcoin-focused businesses are pivoting away from using bitcoin for their services or are having customers pay the higher fees. Bitcoin.com has reported on well-known companies such as Coinbase, Xapo, and Bitpay telling their users they can no longer pay the fees themselves. Since then there have been many other startups that have had to pivot their business model due to the rising network fees. Kraken announced on June 8 it was raising its bitcoin withdrawal fees to (0.0025BTC or $7 USD) due to increasing network fees. Another startup based in Ireland called Bitcart, a service that provides discount gift cards for bitcoin has also revealed some bad news for bitcoiners. The company has recently announced it will soon be disabling bitcoin from its interface and will accept Dash instead. Once again the decision is based on transaction congestion and rising miner fees the company details. “From a merchant’s point of view, bitcoin is extremely problematic,” says Bitcart CEO, Graham de Barra. The backlog is vast, and transactions speeds are terribly slow. I had to wait three entire weeks to fill two customer orders, simply waiting on the bitcoin network to clear. Bitcoin as a method of payment on Bitcart is simply not sustainable, and it’s a nightmare from a merchant point of view; every twenty or so transactions the platform would stop working, and we would have to reintegrate the API. Of course, the subject of rising fees has led to discussing the scaling debate more frequently. One side blames people for blocking Segregated Witness while the other side is upset the block size of 1MB has not yet been increased. There are many heavily disputed debates happening right now across bitcoin forums, Facebook, Twitter, and other social mediums. There are many conversations on forums and social media discussing scaling and rising network fees. In parallel with these never ending arguments many startups continue to announce that they are focusing on altcoins over bitcoin. The remittance app Wyre has revealed it will now be using ethereum due to lower fees, the social network startup Yours detailed the platform will be utilizing litecoin, and the highly anticipated Brave browser who once championed bitcoin has also switched to ethereum. Bitcoin proponents think that if something isn’t fixed soon, the decentralized currency’s network effect will slowly lose its position. Many of the people who believe this are concerned that bitcoin is seemingly becoming less attractive to killer app ideas that use microtransactions or deal with cross-border remittances. 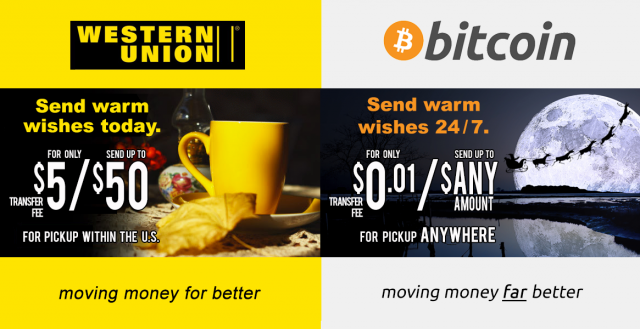 Some now say the infamous bitcoin outperforming Western Union meme does not apply to bitcoin anymore. Even the Prague-based Crypto-Anarchy Institute, Paralelní Polis, is recommending litecoin now over bitcoin. “We will still accept bitcoin, but we can no longer recommend it as a payment system, it’s more of a store of value,” explains the announcement from Paralelní Polis. It’s getting difficult to ignore the fee market changing the bitcoin environment and economy, but at the moment there is no clear answer to how these problems will be solved. What do you think about the rising fee market? Let us know in the comments below. Images via Pixabay, Bitcoin.com, Twitter and Blockchain.info.